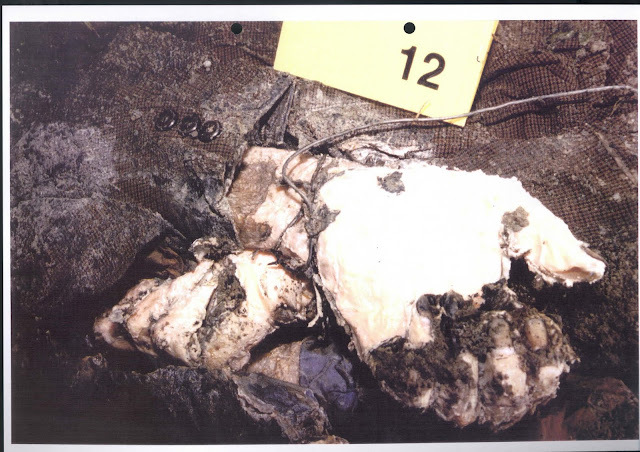 Photo of a ligature binding the hands and wrist from the Nova kasaba mass grave site in 1996, Exhibit P132/87. Courtesy: The International Criminal Tribunal for the Former Yugoslavia at the Hague, Netherlands. Backround: In the first months of war, Serbs destroyed 296 Bosniak villages and killed at least 3,166 Bosniaks around Srebrenica. In 1993, the UN described the situation in Srebrenica as a “slow-motion process of genocide.” In July 1995, Serbs forcibly expelled 25,000-30,000 Bosniaks, brutally raped many women and girls, and systematically killed 8,000+ men and boys.